in Vol. 13 N. 5 dated 1 day of February 1894. So help me God. HOMESTEAD PROOF – TESTIMONY OF CLAIMANT. Question 1 – What is your name and post-office address? Ques 2 – Are you a native born citizen of the United States, and if so, in what State or Territory were you born? 17th day of December 1893, and what is the true description of the land now claimed by you? Ans. I am. East half Southwest fel ¼ Northwest fral ¼ Southwest fel ¼ Sec. 24 Twp. 15 North Range 10 W.R.B.W.R. one room log house., 2 new log houses   1. 14 x 8 ft   1 16 x 14ft established residence in new house Dec 10, 1893. Worth one hundred and twenty five dollars. Ans. Myself. I am unmarried. I have resided continuously on the land. purpose; and if temporarily absent, did your family reside upon and cultivate the land during such absence? not depend on my crops for my whole support. I ahd most of my personal property on land during temporary absence. Ques 7 – How much of the land have you cultivated  each season and how many seasons have you  raise crops thereon? used in any way for trade or business? and? State its kind and quality, and for what purpose it is most valuable. Ans. Mountainous farming lands Most valuable for farming. what they are, and state whether the land is more valuable for agricultural than for mineral purposes). Ans. None to my knowledge. More valuable for agriculture. Ques. 12 – Have you sold, conveyed, or mortgaged any portion of the land; and if so, to whom and for what purpose? Ans. All the personal property I own is on this claim. testimony will be expected to make no mistakes in dates, description of land, or otherwise. (Note: This witness was William Christopher Atchison Sr. brother-in-law to John Gray Blount Nelson. S. A. McCullough – probably Samuel A. McCullough who was listed as the Editor of paper in the 1900 census. Ques 2 – Are you well acquainted with the claimant in this case and the land embraced in his claim? in any way for trade or business? Ques. 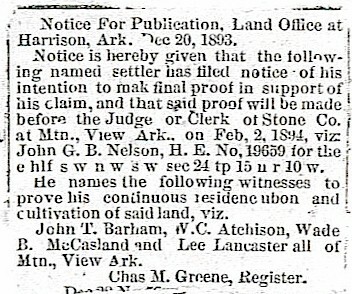 5 – When did Claimant settle upon the homestead and at what date did he establish actual residence thereon? Ques. 6 – Has claimant and family resided continuously on the homestead since first establishing residence thereon? Ans. He has. Claimant is unmarried. Ans. Settler has been absent for short periods to pick cotton, not over two months at a time. Settler has no family. Ques 8 – How much of the homestead has the settler cultivated and for how many seasons did he raise crops thereon? Ques 9 – What improvements are on the land and what is their value? Ques. 11 – Has the claimant mortgaged, sold or contracted to sell, any portion of said homestead? Ans. Not to my Knowledge. Ans. Not interested & I think he has acted in good faith. will be expected to make no mistakes in dates, description of land, or otherwise. any way for trade or business? Ans. Sometime in September 1887, about 15th day of month. Ans. Only been absent short periods in the fall season when he was camping out to pick cotton. Not over 2 months at a time. that he testifies falsely, to prosecute him to the full extent of the law.